Managing Director of the International Monetary Fund (IMF) Christine Lagarde said on Sunday that Egypt is currently undergoing a turning point in its economic structure, noting that the harsh measures taken in the form of floating the currency and cutting subsidies were a signal to investors that Egypt was serious about comprehensively reforming its economic system. In an interview with Extra News on Sunday, Lagarde noted that Egypt’s extensive measures for economic reform had already began to bear fruit with an increase in the number of small franchises, as well as highlighting the increased confidence in the Egyptian economy, materializing in the form of higher foreign investment and economic growth. She pointed to the liberalization of the US dollar exchange rate to account for high inflation rates and increased prices, saying it was influenced by Egypt’s status as a net-importer rather than net-exporter. However, she highlighted that inflation rates have already begun to decline steadily and consistently, and are projected to fall to 12 percent in 2018 – less than half of July 2017’s record inflation rate of 35 percent. Lagarde called for patience after describing Egypt’s economic reform measures as necessary, saying that the country avoided an economic collapse and would not be enjoying its current climate of investor confidence were it not for the implementation of the economic measures. She acknowledged that it is a challenge for everyone involved to face the difficult reality of structural economic transformation, but if the security and economic stability of funding is maintained, then more investors will come, investing directly into the large market of Egypt. 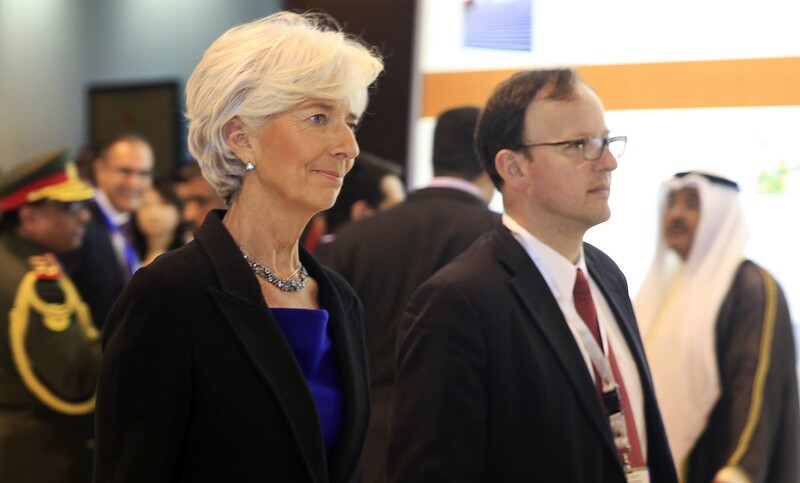 Lagarde also remarked on various key elements including generating employment opportunities for Egyptian youth, which can only be achieved through the private sector, she says, calling for a move away from the public sector providing jobs. She emphasized that the Egyptian experience is improving significantly, with the stability of the economy, stability of security conditions, the government’s determination to reduce the deficit, and the avoidance random grants without scrutiny has worked to attract investors to Egypt and has built their trust in the country’s economy. She also pointed out that Egypt’s growth rate is exceeding regional levels. At 5 percent, Egypt’s growth stands significantly higher than the average growth in the Middle East and Africa – 3.5 percent. This would not have been achieved without the difficulties, sacrifices, and efforts made to maintain the economic transition, concluded Lagarde.